We are into Manufacturing and Exporting high quality Manual Round Screen Printing Machine that can print any round objects like Plastic Bottles, Paper Cones, Gift Materials, Novelties, etc. Constantly focused on optimally satisfying our clients, our company is offering an exclusive range of Screen Printing Machine. 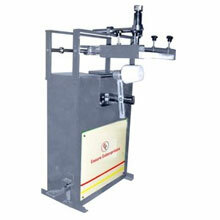 These machine can print up to 5” diameter of round objects. By keeping track of the latest developments, we are fabricating these as per variegated needs of our clients. The offered range is purchased at market leading rates.